The Nature of Grace: First Days of School: Hoooo - ray for School! 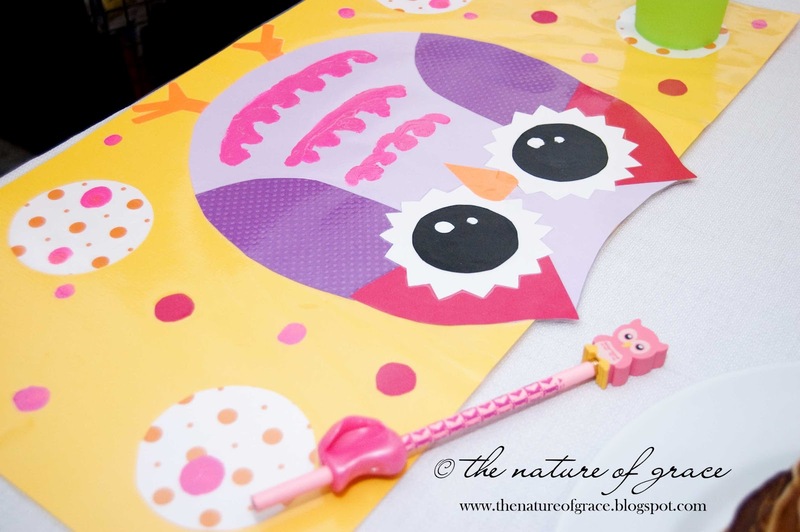 The kids woke up the first day of our homeschool to a decorated dining room - this year I went with an owl theme. I could not find any colorful small owl cut outs that I liked, but I did find a border with a bunch of cute owls on it so I bought that instead and cut the owls out. 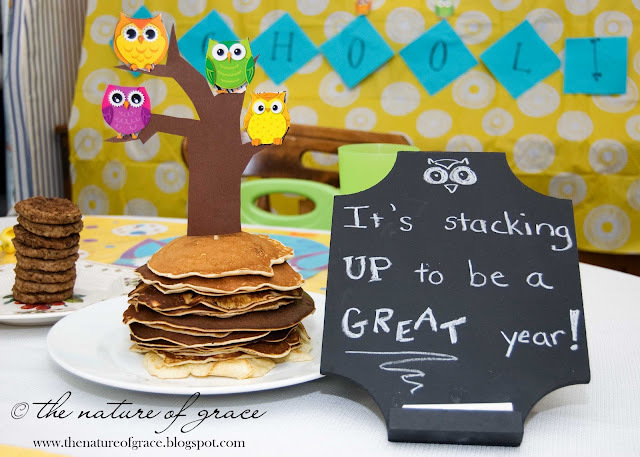 I then glued them to a "tree" I had cut from some brown paper, glued the entire thing to a skewer and stuck it in the middle of a stack of pancakes. (Note the sign and the stack of sausages in the background as well). 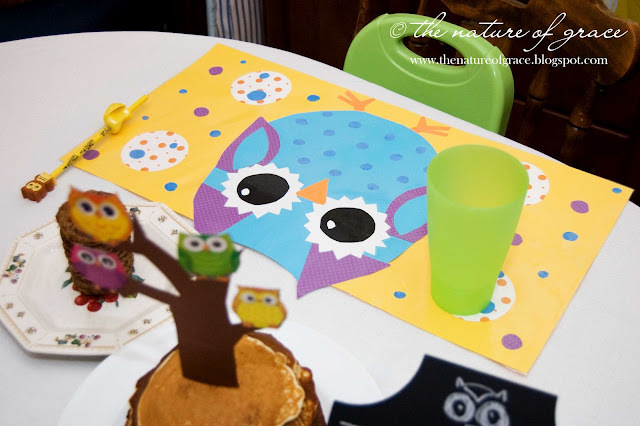 I made owl placemats to go along with the smaller owls and to add a punch of color to the table. I found some super cute owl toppers and bought each kiddo a pencil and a grip to match. Following breakfast it was time to take a look at the new school supplies - but... UH OH! They were snitched by the homeschool elf!!! 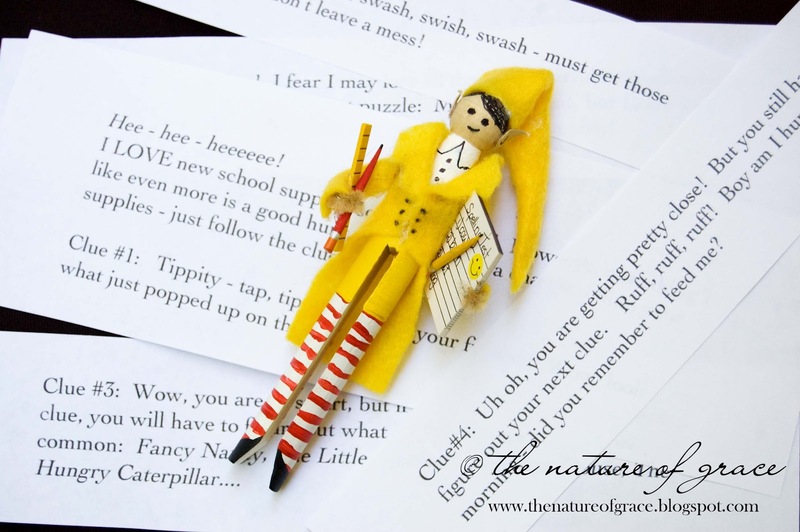 However, one thing the homeschool elf likes even more than new school supplies is a good hunt. Soooo, he risked losing the supplies in order to send the wee ones (actually more like the wee one since our tot wasn't that interested) looking for them via clues he had left around the house. 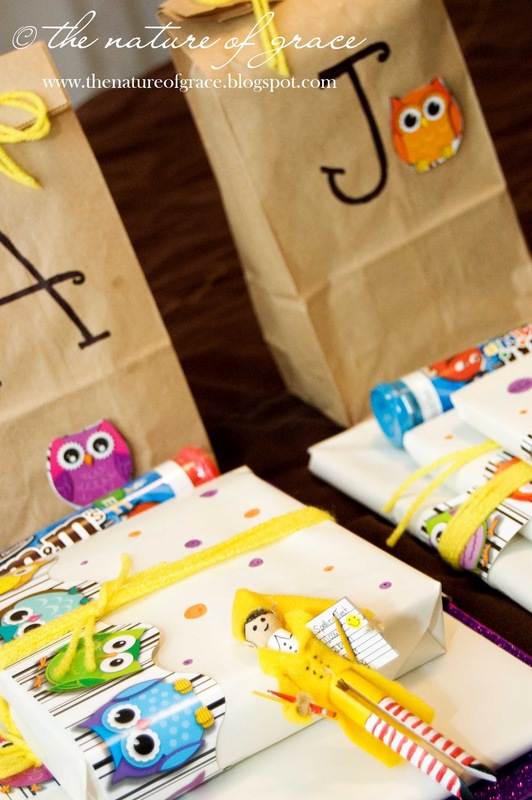 I always think it adds to the excitement and fun on the first day when the supplies are wrapped up so the kids have something to open. This time I used paper bags, yarn, white paper (spots on it were made with marker) and more of the owl border (because there were so many in the package) for packaging things up. Aren't these cards absolutely adorable?! 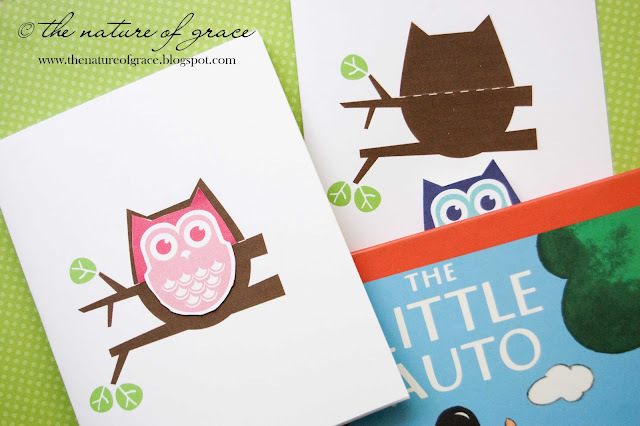 Those owls are actually little bookmarks! I inserted one in a book so you could see how cute they are with the little eyes sticking up. AND they are a FREE printable! Get yours here! In addition to starting some of our main subjects, we started some of our activities from the "Back to Homeschool/School" activity pack I made for Miss A (I do have this available in my TPT store here on SALE this month for $1.50!). She must have had apples on her mind because she drew herself eating apples in her first day portrait. 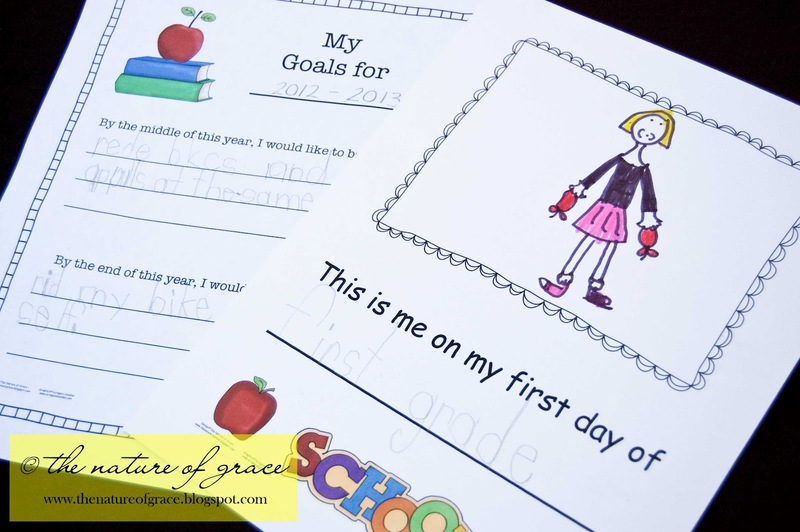 And I loved her goals for mid year - she wants to be able to read a book and eat an apple at the same time. I got such a kick out of that. That prompted a kind of a mini lesson in what I meant by goals. But definitely a keeper to pull out in later years for a good chuckle. 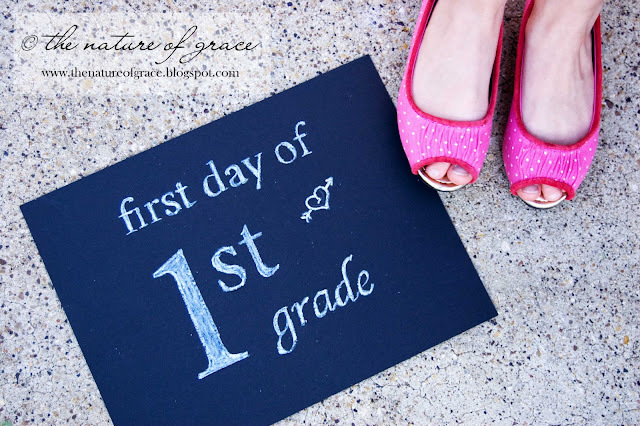 What a fun way to start school, and your pictures are so lovely! 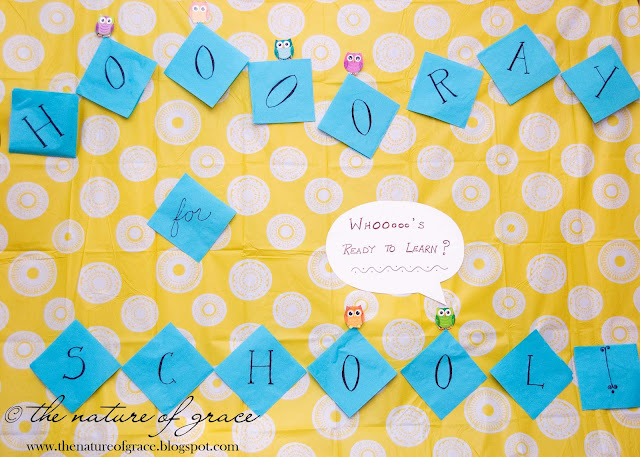 Thanks so much for stopping by Taking Time To Create and commenting on my Magnetic Activity Board post. How cute! 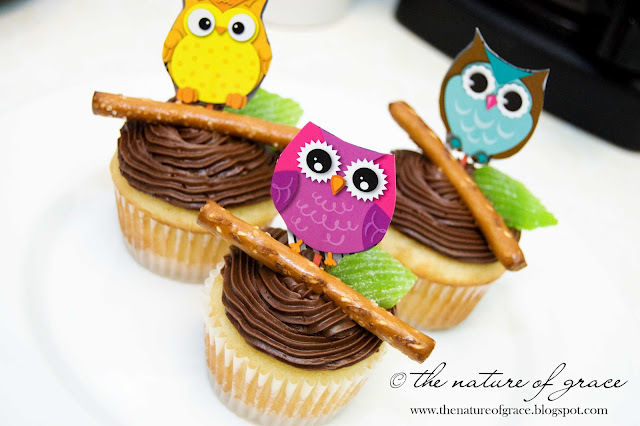 I love the owl cupcakes. The stack of pancakes is adorable and your kids must have been thrilled to wake up to this. 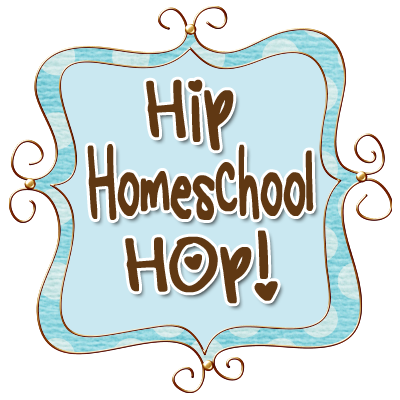 I hope that you and your kids have a great homeschooling year! Thank you for linking up to my Enchanted Thursday Blog Hop! Yes! Miss A was particularly thrilled I think - she loves surprises! This is so cute! I didn't even think of doing anything like this for our first day. Aww, thanks! I appreciate the comment! Adorable. You really made the first day of school fun for your kids. Thanks so much for stopping by my blog. Have a great weekend. Thanks for the invitation, Julie! What a great way to start the school year. Your kids must have felt so special! Totally adore this theme! I'm featuring it on Thursday's Things to Make This Weekend Segment! Thanks for linking up. Thank you, Melanie - I appreciate it! Wow, what a great way to bring in the new year. 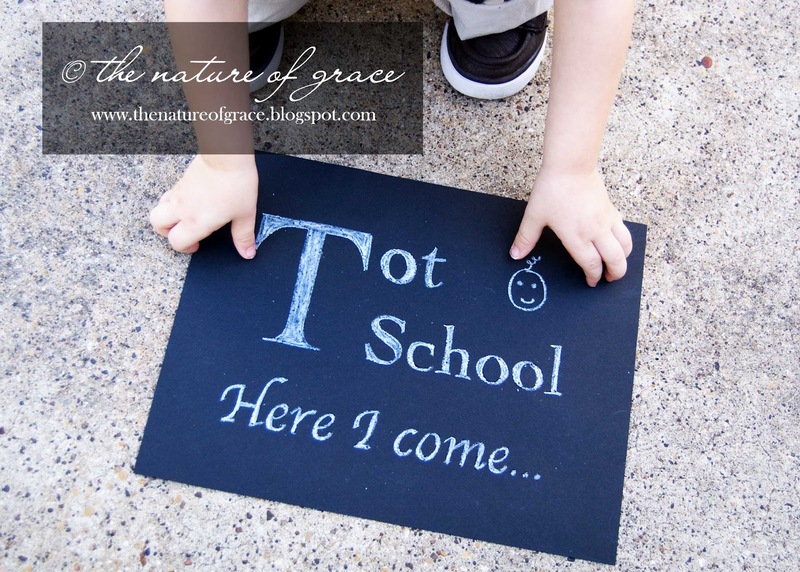 I bet your littles really look forward to the first day of school! What a fun way to start the year! How could you not look forward to the first day of school?? I would love for you to share these ideas at Mom's Test Meal Mondays! Oh, could you please share with us how you made the placemats? For some it might be obvious, but for craft-impaired people like me it is not. ;) LOL! Sadly - I don't have a tutorial in place for the placemats. I just used two 12 x12 yellow papers for the background (glued together) and then made the rest from other craft paper and by looking at a couple of the owls on the border I bought. Hope that helps! Oooh! I love this! We're starting with a Birds theme, but you've inspired me with many fun start of the year ideas!! I'm going to pin this too! I love it! I was already planning to use the bookmarks cards, and this has given me so many ideas. Thank you! Thanks so much, Ginger! I appreciate the feature! Such fun activities and decor! Love the owls! I love this. Makes me want to redo our first day of school. But...we still have our first day of co-op, so maybe I can do something then. So fun! Now following your blog. Thanks so much for your sweet comments, Jenny! Glad to have you following along!